Noise, frustration and unfilled potential. Tonight is extraordinary. Extraordinary because of the unspoken excitement and togetherness that is unfailingly brought about by the presence of a light dusting of snow in a city centre, but also because of the line of musical instrument cases in all sizes anticipatingly propped up against the side of the stage. French horn, oboe, flutes, violins - they’re all here. Even more curious, then, that they are set to be played alongside a band famed for their embracing of all things electronic in the musical instrument world. Tonight is a celebration of when the classic - in the form of trans-European orchestral collective Stargaze - fuses with the digital - in the form of Minnesota post-punk band Poliça, and their resulting freshly released collaboration album Music For the Long Emergency. From the off it is clear this is no low-key jamming session. The presence of those on stage is immediately striking; physically (the amount of players on stage goes into the double-digits) and sonically - the combination of old and new going to war makes even the thick winter jackets vibrate mercilessly. Before opener ‘Speaking Of Ghost’ has even got into its stride, it’s evident that both parties have enjoyed the collaboration process and the fruit it has born; the two sets of drum kits employed are perfectly in sync despite intricacy’s best efforts, and portions of the string section are genuinely rocking out. 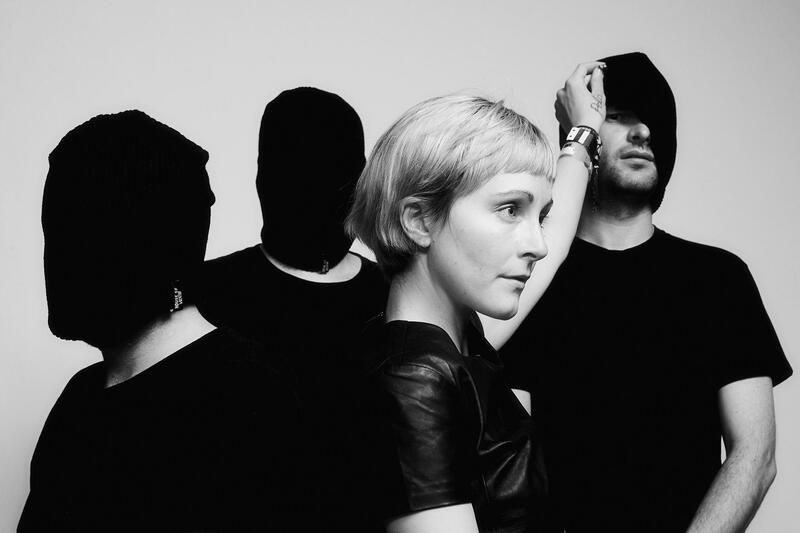 ‘Fake Like’ is a significant departure from what most would know about Poliça. The trademark autotune is switched off to reveal a softness to frontwoman Channy Leaneagh’s vocals rarely - if ever - seen before, whilst the tones of the tune are buoyant in contrast to the dark and mystery the band often refers to. The chorus even has an element of optimism that wouldn’t be so out of place in a stereotypically overly cheery western song. Alas, all returns to normal with the storming introduction of ‘Marrow’, Leaneagh’s almost-shouted vocals happily destroying any safe spaces that were at risk of being constructed. The energy is that much more, Leaneagh is prowling the stage, eyes wide as the string section and synthesiser clash magnificently. This is the gnarly power the evening should have started with. Why didn’t it? If ‘Marrow’ was a showcase of the force of contrasting musical worlds coming together, follow-up ‘Berlin’ is a lesson in respecting the commands of both and, sadly, not in a good way. The synergy between the two elements is bizarrely fractured and virtually non-existent throughout - it looks like one huddle are playing something entirely different to the next and sounds like it too. ‘How Is This Happening’ does not improve matters. Proceedings thankfully sound more in control but this is only because there isn’t a whole lot happening. Ask someone to describe a song fit to be on an album - in contrast to being a commercial single - and ‘How Is This Happening’ would be it. Performing such a song live is no bad thing but considering the first five minutes (the song extends to ten minutes on the record) comprise of Leaneagh asking, “how is this happening?” with little instrumental company, it is a baffling choice. The song does build to an eerie quietness broken only by a determined industrial-sounding beat which, to the band’s credit, is unnerving for a few moments. Layer upon layer, though, is slowly added by synth and orchestra to the point of utter incomprehension, the resulting nonsensical noise being blasted at the audience for a good few minutes. It is hard to know where to look. A welcome form of relief is provided by the significantly lighter ‘Agree’. Similarly to ‘Fake Like’, it has a structure and character far more in line with typical pop than most other Poliça songs do in that it has a distinguished verse and chorus. The representation of the song live is nigh-on identical to that of the record and, probably in a Poliça first, people are able to sing along to the sprightly chorus as - in stark contrast - Leaneagh regales us about how a unidentified companion did not believe in her. There are calls for the band to “play it again” as the mood of the room is noticeably lifted. ‘Bruise Blood’, a “reimagining” of Steve Reich’s ‘Music for Pieces of Wood’, provides an accurate representation of the evening. Starting with a flute and tuned percussion instrument chirping away monotonously in time, the two are joined slowly but surely by all on stage, playing the slightest of variations. Given the volume of those playing and sound being produced, it is an indication the song is to come to an impressive, climactic head whereby sense would expertly emerge from all the noise... right? The song comes to a peak before, instrument by instrument, petering out. There are instances where portions of those on stage dramatically come to a halt, indicating that yes, they know what’s going on, but as a member of the audience it is difficult to distinguish the notes that are intended to build anticipation and those that are to be appreciated. In the more refined moments of tonight’s performance it is clear to see each and every individual on stage is very talented. Frustratingly, though, rather than the two elements complementing each other, they cancel each other out, not nearly fulfilling the potential evidently available and resulting in an experience far inferior to the sum of its parts.